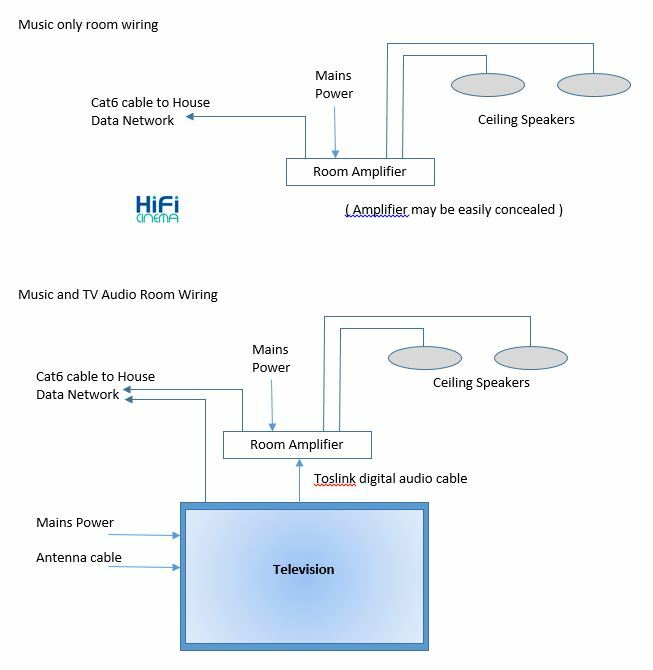 Going back a number of years, Multi-room audio usually meant a large multi-channel amplifier in an equipment room, connected by hundreds of metres of speaker cable to the speakers in individual rooms, coupled to control keypads on walls connected via Cat5 cable. This approach has a number of drawbacks including flexibility, audio quality and control. For a number of years now however, it has been widely recognised that local amplifiers in each room produces a far better sound, allows for far greater flexibility on quality, style and cost etc. The latest in network connected audio players means that this approach is far simpler to implement, and integrates with home data and HiFi networks. Putting the correct format of wiring in place for multi-room, can support both audio and video distribution with a very high degree of flexibility and capability. Power goes to the amplifier position in each room. The amplifier doesn’t necessarily need to be in the same room as the speakers, however limiting the speaker cable distance is good practice. If it is intended to connect local sources (e.g. TV audio, Blu-tooth etc) to the system, then having the amplifier in an accessible location near to the TV position is useful. Speaker cables go from the amplifier position to the local speaker positions. The speakers themselves may be floor, wall or ceiling mounted, and so the cable terminations will be appropriate to one of these locations determined by the room layout and décor. The Quality of cable here is important, and needs to be commensurate with the quality of system being installed. These types of systems rely on network connectivity, so a Cat6 cable to a central network location from the local amplifier completes the wiring. Control is usually provided by WiFi, so part of our solution is also providing good WiFi coverage over the house – see also our page on Home Data Networking.